What a surprise that awaits behind the front door of this home ! Enjoy this massive Wailea Kialoa home spread over two floors, with Fleetwood double pane pocket doors opening to the large lanai spilling into the private pool. 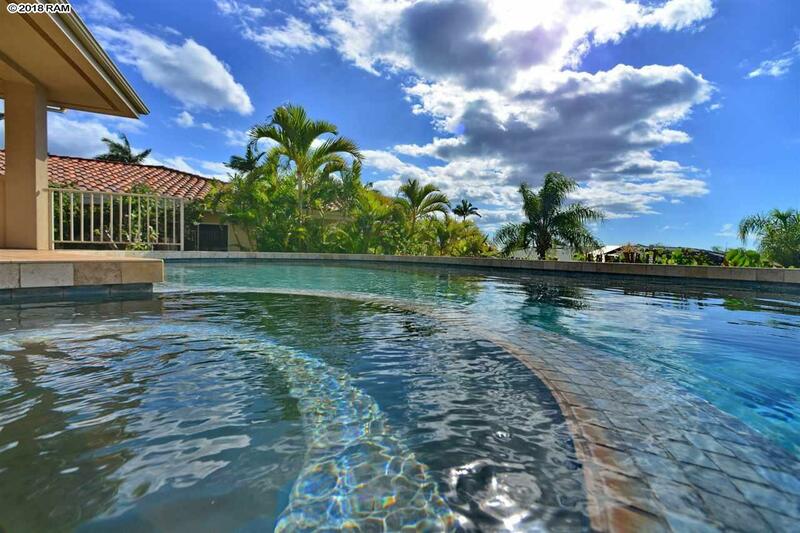 Views from the pool overlook the ocean and swaying palms, while the front of the home faces Haleakala. The gourmet kitchen includes Golden Star granite, a mitered window above the sink with incredible Haleakala views, Viking gas range top, Viking double convection oven, Bosch dishwasher, microwave drawer, custom cherrywood cabinetry, Viking refrigerator, gathering table w/adjustable pull down lighting. Choose from two master suites, one on main floor and one on lower level to relax in and then immerse yourself in the professionally designed theatre with every bell and whistle. Features of the home include Angelica gold travertine flooring throughout, built in kitchen desk with shelves and separate dining area, upper and lower laundry stations, xenon indirect lighting, intercom system. Enjoy all of Wailea's amenities including golf, tennis, white sand beaches, The Shops of Wailea and five star dining just minutes away.